Tcl Dev Kit (TDK) from ActiveState provides essential tools for Tcl programmers, making it easy to create, build and deploy applications. Rapidly deploy Tcl applications to a broad range of platforms, as ready-to-run executables, starkits or starpacks. Simplify development with tools for finding and fixing bugs, managing complex code bases, and optimizing your programs. Take control and work with a choice of GUIs or command line interfaces. ...... Other features include TclApp that easily creates and deploys self-contained Tcl executables to all major platforms, and compiler, which protect your source code and reduce application support. * Deliver your Tcl programs as executables, starkits or starpacks. * Tamper-proof your applications, and protect your code from prying eyes. * Run and manage your Tcl code as Windows services. * Create, manage, export and use TEApot package repositories. 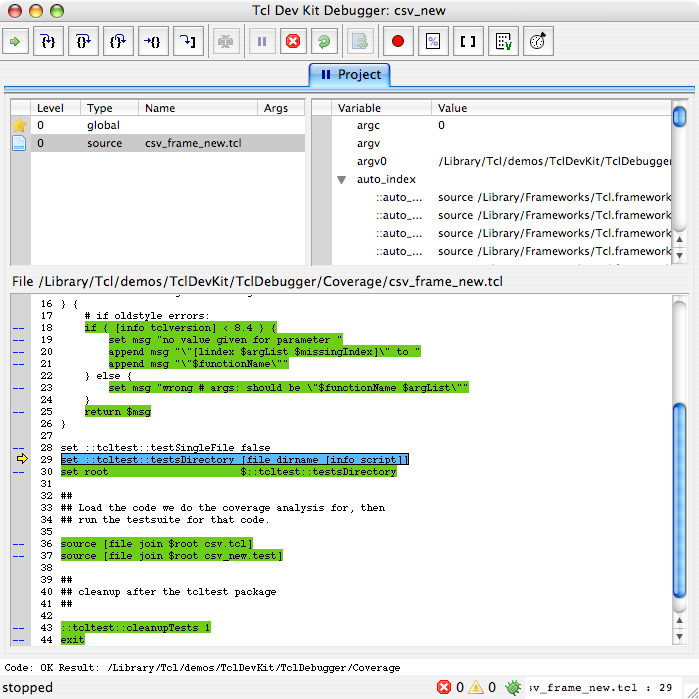 * Kill bugs fast with the cross-platform graphical debugger. * Quickly find errors before running your scripts. * Uncover tricky problems by inspecting Tcl programs while they run. * Improve code performance and reliability through coverage and hotspot analysis. * Understand complex code at a glance with a visual guide to component relationships. Cross platform secure file transfer utility. Within LAN or across the Internet. Qweas is providing links to ActiveState Tcl Dev Kit for Mac 5.2 as a courtesy, and makes no representations regarding ActiveState Tcl Dev Kit for Mac or any other applications or any information related thereto. Any questions, complaints or claims regarding this application ActiveState Tcl Dev Kit for Mac 5.2 must be directed to the appropriate software vendor. You may click the publisher link of ActiveState Tcl Dev Kit for Mac on the top of this page to get more details about the vendor.